We'd say it's a safe bet that while scrolling through Instagram, you've come across a pretty image of a yellow, frothy drink in a mug, probably in front of a café window with just the right amount of light pouring through, especially if your feed skews toward New York. Like matcha, this drink, sometimes referred to as "golden milk," is easy on the eyes but even better for your body, and city girls can't get enough of it. (We prefer Bluestone Lane in NYC's tasty offering.) What is it? 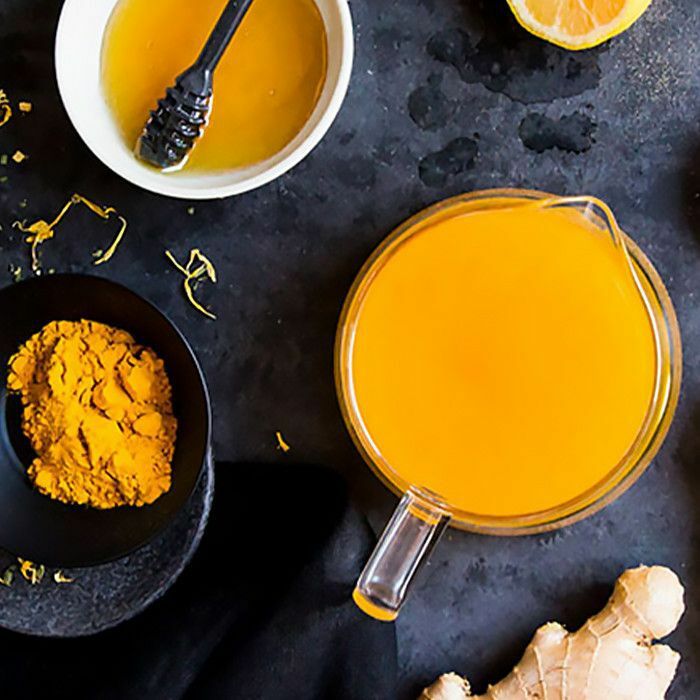 A turmeric latte—and we're here today to break down why this highly photogenic beverage deserves a daily spot in your morning routine. Unlike typical lattes, there is no espresso (or caffeine) involved in a turmeric latte. (We know—caffeine is our lifeblood too.) Instead, it's generally a mix of turmeric, ginger, coconut oil, almond milk, and a little natural sugar to taste. (Check out Goop's yummy recipe.) Drawing inspiration from the ancient Indian herb used to heal everything from acne to arthritis, mainstream society has blended, blitzed, and frothed it into a trendy drink all the cool New York girls are sipping on. And if taking care of your body means you're cool, sign us up. Keep scrolling to learn more about all the incredible benefits of turmeric lattes! Turmeric has the ability to treat extreme skin conditions, such as psoriasis: In a 12-week study, individuals with plaque psoriasis took 4.5 grams of turmeric and were subsequently met with an 88% decrease in symptoms, so you can only imagine the pimple-banishing effects of the yellow spice too. Additionally, May Lindstrom tells us that it's "gorgeous for softening the symptoms of acne and rosacea," prompting us to want to sip on it and slather it on our faces as a mask too. Turmeric has the ability to prevent platelets from clumping together and forming clots, as well as the ability to lower bad cholesterol levels (LDL). Doing so aids in the prevention of stroke and heart disease. Turmeric is a common treatment for dyspepsia, which translates to a variety of digestive issues like gas, bloating, and nausea. In one double-blind study, individuals with the disorder saw relief from their symptoms after ingesting curcuma (a derivative of turmeric) four times a day for seven days. Though still in their infancy, recent studies suggest that curcumin protects brain mitochondria against various oxidative stress, as well as reduces inflammation of nerve cells in the brain linked to Alzheimer's. Similarly, researchers decided to test the effects of curcumin on depression, the latter of which is often associated with inflammation of the brain. While a small study, they concluded that when given 500 mg of curcumin twice daily for eight weeks, individuals with major depressive disorder saw a significant improvement in mood-related symptoms as compared to those in a placebo group. One study found that by stimulating white blood cells, curcumin was able to remove bacteria associated with tuberculosis from infected cells. While this is, of course, an extreme example, it's nevertheless proof that the herb has the ability to counteract bad bacteria in our immune systems. It's also loaded with antioxidants, which help protect cells against damage—a shield of armor when cold season strikes. Do you drink turmeric or take turmeric supplements? What benefits have you seen so far? Please sound off below!